Robin Rectenwald graduated from Duquesne University in 2012 with 20 different student loans and $100,000 in loan debt. 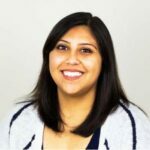 But through working a full-time job, two part-time jobs, working with a financial planner, and creating strategies to successfully pay off her student loan debt, she is setting herself up for financial freedom from her student loan debt. Now, in 2017, she only has five loans left, and is quickly whittling down the amount she owes. College Recruiter: What do you know now that you wish you knew in college? I wish I would’ve known that you can start paying the interest on your loans while you’re still in school. I wish I would’ve known more about the difference between private and federal loans and subsidized and unsubsidized loans. I also wish I would’ve researched student loan options ever year. I wish I would’ve learned more about the cost of living after college (more info on this below). I wish I would’ve applied for more private scholarships. College Recruiter: In addition to working full-time, you also work two part-time jobs, with all money from those part-time jobs going towards paying off student loans. How has that helped? Rectenwald: My balances would be through the roof! When I graduated from college, I had 20 loans with balances ranging from $1,000 to $12,000 and interest rates as high as 10%. If I would not have really investigated these loans after graduation and made an action plan to pay them off, my payments today probably would only be going to the principal. In other words, my balances would be getting bigger because my payments would only be going towards the interest and because of that the interest would just keep growing and growing, I’d be paying my student loans forever. Recent college grads need to know that yes, you may be sending payments, but is it actually paying down the principal balance or is it just going to the interest? Don’t get caught in this trap! College Recruiter: How have you handled the mental stress of having student loan debt? What tips do you have for others who have stress from student loan debt? Rectenwald: I was very fortunate to have supportive parents who graciously let me live with them a few years after graduating college rent-free. However, I was forced to make sacrifices. I lived with my parents until I was 23 and moved back several times. I also didn’t get my first car until I was 25 years old. When I did spend money on anything – rent, utilities, going out with friends, etc., I felt guilty. In fact, I still feel guilty spending money but I know when these student loans are paid off, I’ll have financial freedom. On the other hand, you can’t let student loans stop you from living your life. As long as you’re making a real effort and taking the appropriate steps to budgeting, we can’t let our student lives trap us in our childhood bedrooms. In the end, I coped with this stress by making sacrifices and while it was hard not having a car and living with my parents, I truly believe that sacrificing these items will pay off big in the future. College Recruiter: You originally had 20 loans out. What types of loans were they and what was that process like to secure that many loans? Rectenwald: When I graduated college I had eight private loans and 12 federal loans even with the ability to obtain university scholarships during my time in school. Most of the schools I looked at were private schools with very high tuition rates, but I thought I was getting a deal when these schools offered me a generous financial aid package. For example, I was offered a $20,000 scholarship from Allegheny College, half of what the tuition was. At the time, I looked at it as, “well, I’m not taking out $40,000 in student loans, I only have to get out $20.000.” For three semesters, that’s what I did. I took out private and federal loans to cover this $20,000 difference. At the time, I didn’t even bat an eye at the 10% interest rate because I didn’t know there were lower rates. When I transferred to Duquesne University, the tuition was less than Allegheny College, but because I was a transfer student, I didn’t get offered as nice of a financial aid package as I did from Allegheny College as a freshman. For this reason, I felt like I had no choice but to take out student loans in order to go to college. It seemed part of the norm – it didn’t even occur to me to not go to college because I couldn’t afford it. As an 18-year-old, I had no idea that my payments were going to be hundreds of dollars per month and because I had never lived on my own, I didn’t know realize how all of the financial responsibilities add up such as rent, utilities, insurance, and all of the other expenses that we don’t even know about as a high schooler. After I went through the process of applying for a student loan for the first time, it was almost too easy to keep applying for student loans year after year. It was like clockwork – fill out FAFSA, apply for a new loan, and sign the papers. I didn’t make any calculations of how much I’d owe when I graduated and I wish I would’ve done so. I also wish I would’ve spent more time researching different loans from year to year as opposed to getting the same loan each year. College Recruiter: When six months was up and you had to start paying back loans, how much of a “sticker shock” was this to you? 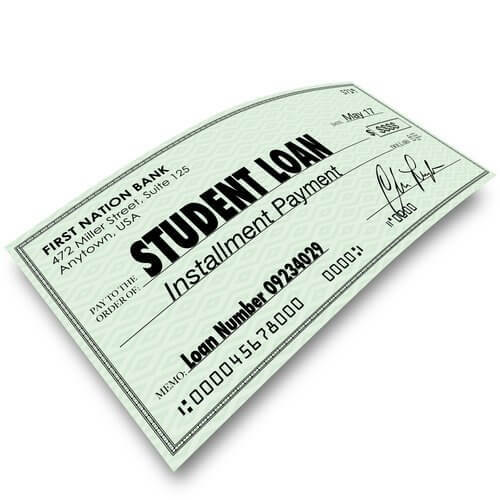 Rectenwald: Yes, sticker shock is real with student loans. If students can, I recommend consulting a financial planner. That’s what I did in August when I knew that my payments were coming in November and I still didn’t have a full-time job. Fortunately, he offered to help me as a pro bono case, and with his help, I was able to learn what I needed to do to pay down these payment plans. He was also able to take a look at my minimum payments to make sure that they would be going to the principal and not just the interest. In addition, he explained the snowball method where I pay the lowest balance with the highest interest rate, which has kept me motivated. I had loans as small as $1,000 and other loans as high as $12,000. I’m glad I was able to pay off the smaller balances first so the interest rate on those didn’t grow. If I would’ve started with the highest interest rate before which was 10% on a $12,000 loan, I wouldn’t have made as much headway as I have. Today, I have a total of five loans, with the highest interest rate of 6.8%. College Recruiter: Whether it’s $5,000 or $100,000, paying back student loans is hard. What else should college students who take out loans truly understand? Rectenwald: It’s important to know much interest is going to accrue up until the day of graduation and even the end of the grace period and how much the monthly payments are going to be. It didn’t sink into my head because I had never had to pay bills or live on my own before. I also had no idea how much money I was going to be making after college, so I realize that even when you get this information, it may not resonate at 18 years old. When did it resonate? When I graduated college. That’s when I found out that my minimum payments for all 20 loans were going to be $980 a month. Because I was still looking for a job, I was feeling a lot of pressure when I knew that my first student loan payment would be coming in November. At the time, I knew of several friends who had graduated college more than a year ago and were still looking for a job. Needless to say, I was scared. I didn’t know how long it would take me to be hired full-time somewhere. I even started to prepare to go back to graduate school so I could defer my loans as a last resort. I’m grateful that I was able to find full-time work relatively quickly. However, even now being out of school for five years and having full-time employment, it’s stressful knowing that each month, 1/3 of my paycheck is going towards student loans, which holds me back from some of my other financial goals such as saving money and contributing to my retirement funds. College Recruiter: If you could change anything what would it be? Do you have any regrets? Rectenwald: I don’t regret going to college because that experience got me to where I am today and I mentioned earlier that I didn’t really have a choice of not going to college. For this reason, I was almost forced to take out these student loans so that I could find a well-paying job after college. I also don’t regret having so much student loan debt either because it opened my eyes to the importance of budgeting and paying off debt. The only thing I would change is saving every single penny I made while working in high school, college and even now. I’m not the best saver and it is something that I am working on, but I just think if I would’ve saved up a lot more money in college, I would be in a lot less debt than I am today. However, I can’t beat myself up too hard because I know that I did make a dent and I could be in a much worse shape than I am today. College Recruiter: What should students who take out student loans truly realize about the financial impact of student loan debt? Rectenwald: I think the best way students can rationalize how these student loans are going to impact them in the future is maybe sitting down with their parents for a financial lesson. I didn’t know how much all my financial responsibilities could add up in the future on top of my student loan payments. When we graduate from college, we’re eager to get our own apartments, get a car and finally use some of our extra spending money for spending. When you have student loan debt, these wish list items quickly fade away. For others, this is where they rack up credit card debt. College Recruiter: What tips do you have for someone just starting to pay back student loan debt? Rectenwald: The best tip my financial advisor gave me was paying off my student loans through the snowball method. This method really kept me motivated because I paid off the small balances first and then I was able to use that money to go towards the next balance. In just a year, I saw 20 of my students loan go down to 19, 18, 17 and so on. It was always exciting to pay off another student loan. I also encourage students to RESEARCH refinancing opportunities. It made sense for me to refinance my private loans that I got out in 2008 because they had a 10% variable interest rate. Thanks to Citizens Bank, I was able to refinance my loans to a fixed 5% interest rate. While refinancing these loans lowered my minimum monthly payments, I continued to send $1,000 towards my school loans as if I still had that $980 minimum a month. In other words, I send extra payments towards my school loans which is helping me pay them down faster. College Recruiter: What other advice do you have? If you’re working an additional part-time job after college, I highly recommend sending this paycheck directly to your student loans. That’s what I do – I don’t touch a penny of my part-time income. Instead, as soon as the check is deposited into my account, I make a payment on my student loans for the exact same amount. Don’t let your extra hard work go to waste. If you don’t have a part-time job, make it a priority to send extra money to your loans by adding it in your budget. This is how they will get paid off faster. Don’t forget about your other financial goals. While I was determined to pay off my student loans before I was 30, I needed to make sure that I wasn’t sending every extra penny to my student loans. I needed to divide and conquer. Make sure to come up with a budgeting plan that also allows you to send extra money to your emergency savings, regular savings (have a goal to keep you motivated to work towards) and my retirement savings. Just as we wish we would have prepared better for student loan debt, make sure you’re preparing now for retirement. Don’t give up! It’s a slow start, but I promise you, your sacrifices and due diligence will pay off! Just think, when you’re not paying that extra $500 monthly payment to your student loans, you can use that money to start saving for a house or save for that next big trip to Europe. That’s what keeps me motivated – finally reaching financial freedom! Are you a college student or recent college grade stressed by student loan debt? Stay connected to College Recruiter for more advice and tips like this. Start by registering with College Recruiter to have job alerts emailed to you. Then visit our blog, and connect with us on LinkedIn, Twitter, Facebook, and YouTube. About Robin Rectenwald: Robin Rectenwald has a full-time job working for WordWrite Communications a Pittsburgh, Pennsylvania public relations firm, that she absolutely loves. But that hasn’t stopped her from finding unique side jobs to help pay off her student loan debt. Rectenwald graduated from Duquesne University in 2012 with 20 different student loans and $100,000 in loan debt. Now, in 2017, she only has five loans left, and is quickly whittling down the amount she owes.